Grey is a simply stunning shade for your kitchen design. Creating a cool, classy and calming finish, it’s the perfect foundation colour for any kitchen space. As well as being wonderfully bold and beautiful in its own right, grey is also an incredibly versatile shade, lending itself perfectly to a range of different colour palettes and allowing you to accessorise with different shades of your choice. The Remo Silver Grey is one of the most gorgeous and modern kitchens readily available at Number One Kitchens. Not only is it aesthetically perfect, but it’s completely customisable too, which means you can make it your own and transform it to fit the kitchen space within your home. You can see in these lovely pictures that we’ve paired the Remo Silver Grey with a wonderful broadoak rye shade. The grey and brown hues blend together perfectly for the most wonderful and contemporary design, but you can switch out the broadoak rye for a colour of your choice, mixing it up to suit your needs! There are 27 colours available for you to choose with Number One Kitchens. From lights to darks, neutrals to vibrants – we have it all. And what’s more, each of our colours are available in both a matte or gloss finish. A wonderful feature of this incredible kitchen layout includes an integrated breakfast table which pulls out for a truly versatile finish. It pulls out from the wonderful kitchen island area, which creates a seamless space for food preparation and entertaining. Why not accessorise with some funky chairs to create a dining and relaxing area within your kitchen space? 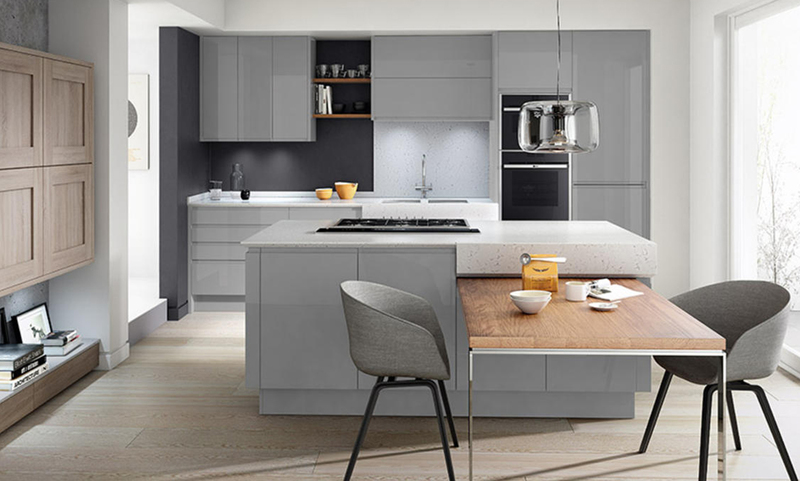 Another incredible feature of the contemporary Remo kitchen with silver grey finish is the host of different upper and lower cupboard options, each of which presents a fantastic storage opportunity. Storage is essential in a modern kitchen, enabling you to sweep away your kitchen accessories and items to upkeep a flawless and clutter-free home.